For the flower aficionado the name South Africa must immediately bring to mind the fabulous Protea . 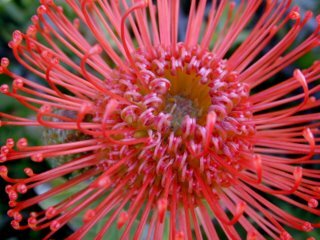 Members of the Proteaceae--a plant family found almost exclusively in the Southern Hemisphere--these showiest of all South African shrubs display mammoth inflorescences, some of which can attain up to 30 cm in diameter! In addition, the large, colorful bracts surrounding the tiny flowers are often highly ornamented with silken hairs, giving the inflorescence a feathery, almost birdlike appearance. In mid-winter, when the proteas reach their peak bloom, a visit to the Arboretum & Botanic Garden's South African Garden is a trip to a magical paradise of almost unearthly beauty. Adding to the extravaganza are the leucadendrons, also members of the Proteaceae (a name inspired by the Greek god Proteus, master of disguise). Indeed the leucadendrons are well-known for their dazzling variety in foliage form and color and are choice favorites of cut-flower growers. 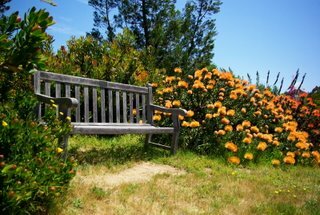 Several specimens of the deservedly world-famous silver tree (Leucadendron argenteum) grace the Garden, their silvery, silky leaves gleaming in the sun and catching the breezes off of the Monterey Bay in the distance. 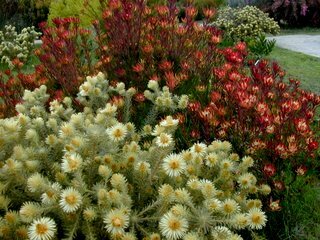 Also highlighted are many forms of Leucospermum. The inflorescences, which appear in mid-spring are composed of many brightly colored flowers, the whole resembling a pincushion, which turns out to be the plant's common name. The Garden's South African Garden is also home to one of the largest collections of members of the genus Erica (or Cape heaths) outside South Africa, where a staggering 605 species occur in an area not much larger than Santa Cruz County. The Garden's Erica collection illustrates magnificently the huge diversity of color and form found in these shrubs. The peak flowering times are later Winter/early Spring and mid-Summer.